This red insulated nylon delivery bag measures 23" x 13" x 15", and helps to keep food perfectly cool thanks to the waterproof insulated aluminum foil interior. 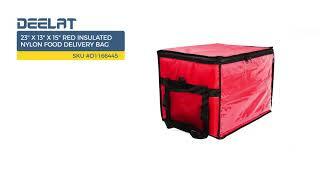 This is a top load bag, making it easy to get food products in and out. The 1680D nylon material is incredibly strong and built for durability and high performance. No matter what your food transporting needs, you're going to see that this product is the safe, easy, and effective way to get perishable products from place to place in a timely fashion.